The Brno City Zoological Garden is situated on 41,2 hectares of forested slopes on the outskirts of the Moravian metropolis Brno. The Zoological Garden of Brno City (Brno Zoo) was founded in 1950 and it was opened to the public on 30th of August 1953. It is a contributory organization of The Statutory City of Brno - the second largest city of Czech Republic. 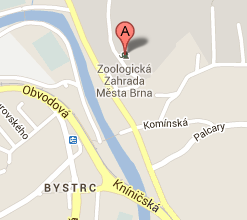 The zoo is situated in attractive area of 41,2 hectares of „Mniší hora“ (Monk Hill) forested slopes. The Brno Zoo is a member of important international organizations as The Union of Czech and Slovak Zoos (UCSZOO), The European Association of Zoos and Aquaria (EAZA), The Eurasian Regional Association of Zoos and Aquariums (EARAZA), The World Association of Zoos and Aquariums (WAZA), The International Zoo Educators Association (IZE) and other. In the zoo is also the CITES Centre for animals from illegal international trade. Thanks to an expert knowledge and breeding successes the Brno Zoo can cooperate on realization of prestigious breeding programs for worldwide most endangered animals. Zoo is also participated in conservation of endangered animal species in the Czech Republic and cooperates with professional scientific institutions. Very important is for the Brno Zoo a conservation education – staff of Educational Department is in cooperation with zoologists and breeders preparing various educational programs and excursions for schools and other concerned persons. Also many activities for ill and disabled children take place in the zoo. The Brno Zoo produce promotional materials and the quarterly Zooreport journal, carry on own web pages, organize various actions for public and participate in tourist trade fairs. The zoo is opened daily all year and the visit rate was 257 990 visitors in the year 2015.